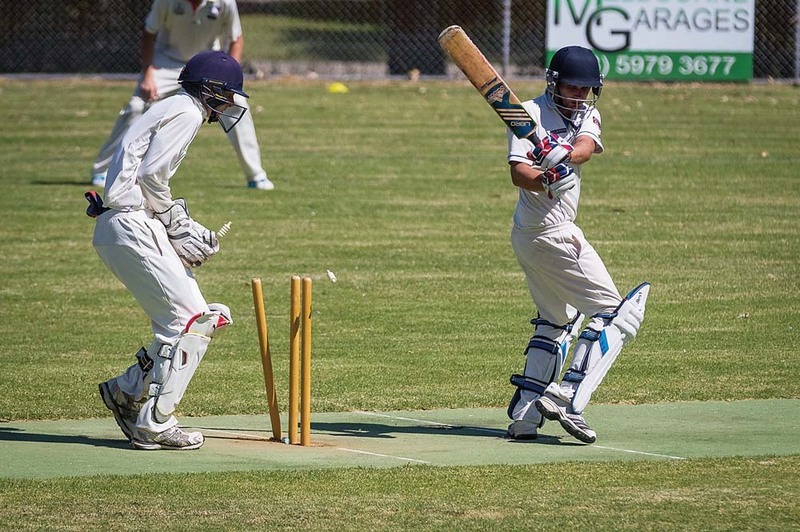 RED Hill have worked hard to surpass their target of 200, as they took on Moorooduc in the second day of their two-day clash. Having finished day one on a high and restarting at 0/43, Red Hill quickly lost their first two wickets and were sitting a little more uncomfortable at 2/52. Simon Dart was their best batsman, as he scored 59 runs batting at number 4 to help guide the Hillmen to a three wicket win. At Ballam Park East, a pitiful Pines performance saw them waste a golden opportunity to defeat Long Island. Chasing just 110 runs to claim a first innings win, no Pines batsman could make an impact, with their top scorer putting just 17 runs on the board. They were bowled all out for a lowly 61. Long Island came in to bat to close out a successful day, scoring 2/32. At Ditterich Reserve, Baden Powell suffered a scare as Main Ridge came close to knocking off their mammoth total. Baden Powell were dominant on day one, finishing at 6/336 at stumps. In reply, Main Ridge showed they had plenty of fight in them. Four of their batsmen registered scored of over 45, Shaun Foster top scoring with 65. Main Ridge came close, but fell short. They were bowled out after 75 overs for 289. A BRILLIANT spell of bowling for Heatherhill has seen then scrape out a narrow first innings win over Delacombe Park. Defending a weak total of 112, Heatherhill had their work cut out for them. Things got off to a brilliant start for them as they dismissed Delacombe Park’s opening three batsmen for single digit scores, with Jake Theobald doing the damage. Theobald would go on to take 6 wickets off his 19 overs. He clean bowled their final batsman to knock them all over for 89. Coming in to bat to close out the day, Heatherhill continued their positive play by finishing at 4/127 at stumps. At Roy Dore Reserve, a well batted innings of 80 from Scott Manders was not enough to help Seaford reach their target against Carrum. Manders had batting partners fall all around him, with the other top and middle order batsmen combining for just 22. They finished all out for 146. Despite some good bowling from Isuru Dias, Hastings were not able to defend a target of 120 against Mt Martha. Dias dismissed the opening four batsmen, but his efforts were not quite enough. Mt Martha held on and ended up getting over the line with five wickets to spare. A half century from Billy Quigley proved the difference between Rosebud and Seaford Tigers, as Rosebud ended up being bowled out with a 41 run lead. The ‘Buds finished at 165 at stumps. TOOTGAROOK battled hard to try and reach their target of 287 against Boneo, but ended up falling short in their two-day clash. Things started well as opener Robert French smacked three 6s on his way to a fantastic innings of 70 runs. Middle order batsman Travis French also contributed with a half century, but ultimately they could not drag their side over the line. With eight overs left to play, Tootgarook were bowled out for 225. Skye had a tough afternoon away from home at Carrum Downs, failing to defend their total of 152. Things looked as if they would be competitive, before Ryan Lynch came in for Carrum Downs and put the game to bed. He smacked 11 boundaries on his way to 79. Carrum Downs declared for 164, wanting a chance to bowl before the day was done. Skye fared worse in their second innings, and finished the day at 8/56. Balnarring have let a good chance at defeating Dromana go begging, as they could not chase down an attainable target of 130 at Dromana Reserve. Balnarring were rattled to start their innings and struggling badly at 3 wickets for 5 runs. They recovered slightly from there but lost their last wickets quickly, going from 3/78 to all out for 112. Zacc Klan took 5 wickets for Dromana. Tyabb performed well against Rye at Bunguyan Reserve to secure a win, surpassing their target off just 52 overs with six wickets to spare. Frankston YCW had a bye. BAXTER have claimed a rare and comprehensive outright win over Pearcedale, besting them over two innings to claim maximum points. Having declared four runs ahead on day one, Baxter would need to work quickly to dismiss Pearcedale on day two to get a second crack at batting. A middle order innings of 41 from Luke Lowry helped put Pearcedale in with a shot of avoiding the double innings defeat. His side were bowled out for 152. Baxter lost two early wickets in their second innings, and would have to work hard from 2/8. From there they wasted little time, smashing boundaries to reach their target off just 34 overs. Chris Brittain was at his usual best for his side, hitting two 6s on his way to 68. A good partnership between Blake Hogan-Keogh and Neil Barfuss has helped Flinders claim victory over Mornington. The two put on a near 100 run stand to help Flinders reach their target of 166 with 6 wickets and 7 overs to spare. Langwarrin were almost subjected to an outright double innings loss as well, as Sorrento dominated them at David Macfarlane Reserve. Having set a target of 255 for victory on day one, the Sharks were in a good position. Langwarrin came in and were quickly at 3/11, and things never got much better. Jake Prosser top scored with 21, as his side collapsed for just 64 runs off 27 overs. Adeel Hussain has ruthless with ball in hand, posting career best figures of 8/33 off 14 overs. The Sharks could smell the blood in the water, and sent Langwarrin in again by enforcing the follow on. Hussain again ran rampant with 4 wickets, taking his total to 12 for the day, but Langwarrin held on. At close of play they still had 5 wickets in hand, avoiding a truly nasty defeat. At Harry MacDonald Oval, Peninsula OB were able to defend their total of 267 with relative ease. Their Mt Eliza opponents got off on the wrong foot and lost both openers for just 4 runs combined. They finished all out for 137 off 57 overs. James La Brooy took 6 wickets.